David Grissom is a monster groove soloist and unsung guitar hero. There's no other way to say it. 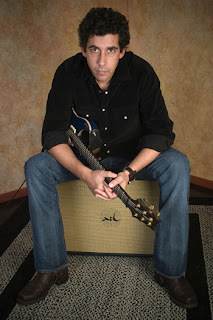 A real American heartland roots player and songwriter, he's worked with Mellencamp, Buddy Guy, Dixie Chicks, Robben Ford, Allman Bro's, the list goes on. Most of us have heard Grissom without knowing it. He also worked in the Texas band Storyville, with Double Trouble alums Chris Layton and Tommy Shannon. I was first awakened to David Grissom on an Austin City Limits show where he walked on stage and joined the featured band for one tune and then left. I've never forgotten it. Check this YOUTUBE CLIP from a Hot Licks guitar instruction video. Grissom is featured in Hot Licks' Lone Star and Southern Guitar videos which seem to be discontinued, though you may be able to find used VHS versions online. Guide to Blues Rock Guitar Soloing , a book/CD by Grissom, is currently available. My web research indicates Grissom really likes PRS guitars these days, and seems to be endorsing them. He's still a Strat-o-Brother though because of his Texas tone and churnin' urn of burnin' groovitude, as witnessed in the youtube clip above. All you Eric Johnson fans will especially enjoy it. www.davidgrissom.com contains pics of Grissom's guitar collection, including a 1960 Fiesta Red Stratocaster; his sole instrument for a few years. Like I say-- Certified Strat-o-Brother. WATCH THE YOUTUBE CLIP!! !